Talon for Twitter isn’t new, but it’s recently been overhauled and turned into one of the best Twitter clients around. It’s a good-looking app, as you can see in the images above, but more importantly it’s a very powerful app, primarily because of the amount of control it gives you. You can choose between three different themes, selecting the colors, fonts and timestamp style and even the line spacing. The app supports home screen widgets too, which are similarly customizable, and the control it gives you doesn’t end at the aesthetics. 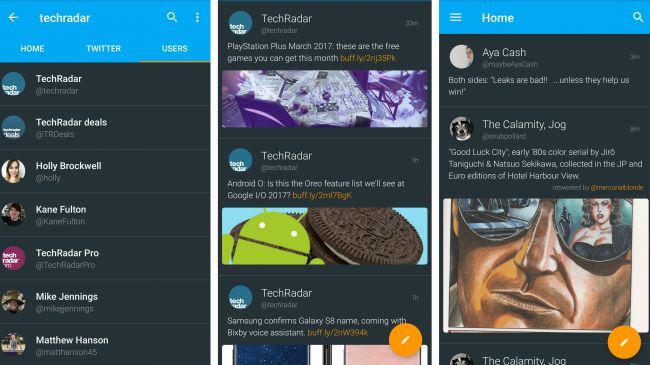 Talon also lets you create up to eight home pages that you can swipe across to get to different parts of your Twitter account – be it mentions, direct messages, tweets from users that you’ve favorited, or a number of other things. Talon for Twitter also includes a night mode and a do not disturb option, so you won’t be bombarded with notifications when want to be slumbering. We found Talon is great when you get down to the core activities of reading and posting. GIFs and videos can be viewed directly from your timeline, images can be rotated and cropped before you post them, users can be muted or favorited, you can be signed in to two accounts at once, and if you use Twitter on multiple devices you can use ‘TweetMarker’ to sync your timeline position. And these are just some of the highlights of Talon, there’s too much to detail here, but suffice to say if it’s something you realistically wish a Twitter client could do, Talon probably can.